1.1. Why Enhancing Heat Transfer Rate Is Crucial? 4.1. How Consequential Is Nanofluid Flow in Channels? 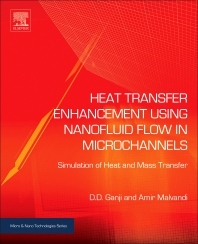 Heat Transfer Enhancement Using Nanofluid Flow in Microchannels: Simulation of Heat and Mass Transfer focuses on the numerical simulation of passive techniques, and also covers the applications of external forces on heat transfer enhancement of nanofluids in microchannels. Economic and environmental incentives have increased efforts to reduce energy consumption. Heat transfer enhancement, augmentation, or intensification are the terms that many scientists employ in their efforts in energy consumption reduction. These can be divided into (a) active techniques which require external forces such as magnetic force, and (b) passive techniques which do not require external forces, including geometry refinement and fluid additives. Materials scientists, chemical engineers, chemists and physicists seeking to improve the heat transfer rate in small-scale systems with nanoparticle inclusion. Amir Malvandi is working as an associate researcher at Sun & Air research institute (SARI) in Ferdowsi university of Mashhad, Iran. He Received his B.S. in mechanical engineering from this university in 2009 and graduated from Amirkabir University of Technology in 2012. His main areas of research are fluid flow and heat transfer in curved pipes, numerical study on the flow over bluff bodies, Homogeneous and non-Homogenous nanofluid and convective heat transfer.